Nicolaus Bruhns is one of the best-known representatives of the North German organ school. Being a contemporary of Dieterich Buxtehude, he belongs to the last generation of that illustrious school. His father was organist in Schwabstedt when Nicolaus was born. He learnt to play the organ as well as string instruments. In the latter department his teacher was his uncle Peter in Lübeck; here he also became the favourite pupil of Buxtehude. Bruhns developed into a virtuoso on the violin and on the organ. The German composer and theorist Johann Mattheson reported that Bruhns sometimes played both instruments at the same time: while playing the violin he realized the basso continuo part on the pedal of the organ. For some years he worked as a composer and violinist at the court in Copenhagen. In 1689 he was appointed organist of the Stadtkirche in Husum. It was stated that "never before (...) [had] the city heard his like in composition and performance on all manner of instruments". When the civic authorities in Kiel tried to make him move to their town the Husum authority raised his salary. He remained there until his death. Bruhns has become best-known for his organ music. He has left only six organ works which can be explained by the fact that organists used to improvise. The rest of his extant oeuvre comprises sacred cantatas, mostly on a German text; only two have a text in Latin. It is especially regrettable that no chamber music from his pen has come down to us. Whether he has written any, is impossible to say. Some of his cantatas include virtuosic violin parts and it is generally assumed that he intended them for his own performance. Also notable is the fact that three of the twelve sacred works are for bass solo. It is possible that they were written for the bass Georg Ferber, who had been Kantor at Husum for 14 years before moving to nearby Schleswig two years before Bruhns arrived. Most of the sacred works are in the tradition of the sacred concerto. This means that they are through-composed, without formal division into different sections, and that solo and tutti episodes are fully integrated. There are also a couple of pieces which point in the direction of the cantata that was to become the standard in the 18th century. One of these is O werter heiliger Geist which comprises five stanzas. The first are solos for bass, soprano, tenor and alto respectively, whereas the fifth and last is for the tutti. It is one of three pieces on a madrigalian text; the second is Hemmt eure Tränenflut. The third, Muss nicht der Mensch auf dieser Erden, is based on the first verse from Chapter 7 of the Book of Job. The Lutheran chorale plays a minor role in Bruhns's sacred vocal oeuvre: Erstanden ist der heilige Christ is based on the first three stanzas of the chorale, but Bruhns doesn't make use of the melody on which it was sung. The only time Bruhns includes a chorale melody is in the fugal Amen of Hemmt eure Tränenflut, whose subject is the first line of Christ lag in Todesbanden. The other pieces are all settings of complete psalms (130: De profundis clamavi; 100: Jauchzet dem Herren alle Welt; 128: Wohl dem. der den Herren fürchtet) or verses from psalms. Paratum cor meum and Mein Herz ist bereit have exactly the same text: Psalm 57, vs 8-12. Der Herr hat seinen Stuhl im Himmel bereitet is a setting of four verses from Psalm 103. A hybrid piece, so to speak, is Ich liege und schlafe, which opens with the last verse from Psalm 4 (I will both lay me down in peace, and sleep: for thou, Lord, only makest me dwell in safety) and continues with a madrigalian text in two sections. Lastly, Die Zeit meines Abschieds ist vorhanden is a setting of verses from Paul's second letter to Timothy (ch 4, vs 6-8). 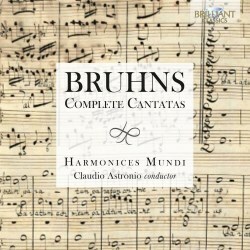 Bruhns's cantatas are a mixture of Italian influences and German traditional counterpoint. De profundis clamavi is a fine example: it is scored for bass, two violins and bc, and imitative counterpoint plays a prominent role in this piece. It is not only the violins which imitate each other, but they also imitate the solo voice. Obviously the tutti episodes are also dominated by counterpoint. It is especially the virtuosity of the vocal and instrumental solo parts which testifies to the Italian influence. Jauchzet dem Herren alle Welt is a sacred concerto for tenor, two violins and basso continuo. The tenor part is full of coloratura and long melismas. Mein Herz ist bereit is for bass, violin and basso continuo, and here the violin part is technically demanding, including double stopping and virtuosic figurations. This piece is comparable with, for instance, the concerto Nisi Dominus by Bruhns's contemporary Heinrich Ignaz Franz von Biber. The interpretations by the Italian ensemble is quite good. It was probably a good idea to attract German-speaking singers for the most demanding parts: not only the four solo concertos, but also those for two tenors (Erstanden ist der heilige Christ) and for two tenors and bass (Paratum cor meum). I did not know Richard Resch; for me he is the revelation of this production as he has a very beautiful voice which is perfectly suited for this repertoire. His diction is excellent and so is his text expression. I also like his dynamic shading on long-held notes. He deals impressively with the coloratura in Jauchzet dem Herren alle Welt. Johannes Weiss is also quite good, but is a little underexposed; the balance between the voices could have been better. I am less enthusiastic about Christian Hilz. There is little wrong with his singing, but it is not very differentiated in colour and the lower part of his tessitura is rather weak. As a result the concertos for bass solo are not very expressive. Marina Bartoli Compostella, Karin Selva and Elena Biscuola are doing well, despite being not German speakers. The pronunciation of the latter leaves something to be desired, and the same goes for the diction of the two sopranos; the text is sometimes hard to understand. I have nothing but praise for the contributions of the instrumentalists. Esther Crazzolara deserves special praise for her performance of the violin part in Mein Herz ist bereit. Bruhns's cantatas have been recorded before by the Ricercar Consort (Ricercar, 1989). This new recording is no match; only Richard Resch is up to the competition. That said, this is a very respectable and in many ways enjoyable production. The fact that it is available at budget price is a not unimportant bonus.